Ruth’s Chris Steak House intends to remodel its Downtown Southbank restaurant in the Doubletree by Hilton Hotel Jacksonville Riverfront. The restaurant opened there in the fall of 1997 when the property was the Hilton Jacksonville Riverfront. The hotel also operated as Crowne Plaza before becoming the DoubleTree. Ruth’s Chris seeks a building permit to renovate the Southbank restaurant’s bar, lobby and dining areas at a job cost listed at $450,000. No contractor is listed, and that cost could change because the plans are in for review. The work includes new floor finishes; wall covering and finishes; paint; curtains; lighting fixtures; tables, chairs and stools in selected areas; and minor millwork and floor tile revisions. No kitchen or exterior work is included. Of the 8,614-square-foot restaurant, 5,698 square feet will be altered, according to the permit. The restaurant is owned by Ruth’s Hospitality Group Inc. of Winter Park. HMD Group Architects of Doral is the architect. The property is owned by MHI Jacksonville LLC in care of Sotherly Hotels LP of Williamsburg, Virginia. Plans show 263 seats, comprising 172 in the main dining room, 34 in the lounge, nine at the bar, and 24 each in two private dining rooms. 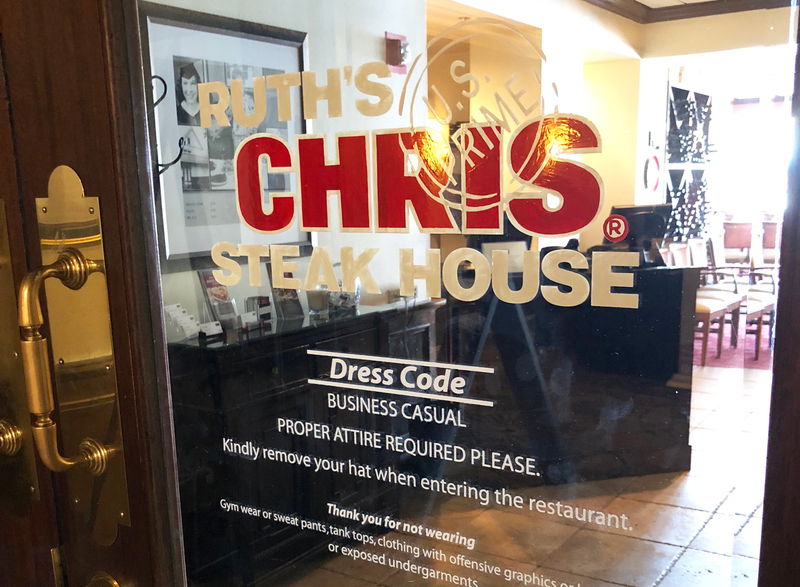 A spokeswoman for Ruth’s Chris said the company could not respond at this time. It also is renovating its Ponte Vedra Beach restaurant at 814 A1A N., No. 103. St. Johns County issued a building permit Aug. 10 for an interior remodel at a job cost of $800,000. Restaurant General Manager Christine Griggs said Sunday renovations began on the 270-seat restaurant in early August and the completion date should be late October or early November. It will not be closed during work. Griggs said the interior work is similar to that of the Downtown restaurant with some exterior work on the entrance. No kitchen work is involved.